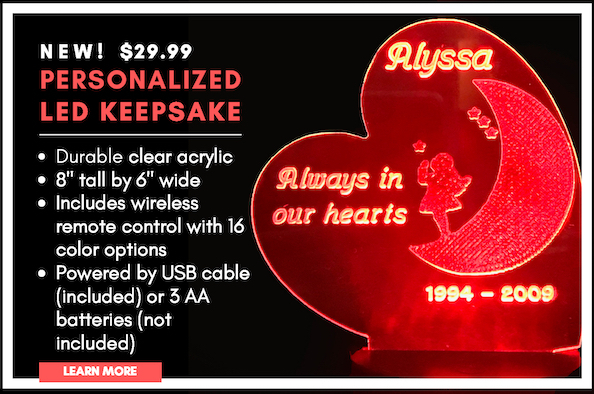 Official Angel Babies Wave of Light Remembrance Event Product - 25% donated to The 3rd Annual Angel Babies Wave of Light Remembrance event. Forget Me Knot Halo Bracelet by HEAVENSBOOK ANGELS™ is to be worn by anyone with an Angel in Heaven. The open knot upon your wrist has no beginning and no end, symbolizing the love of your Angel you will knot forget. Perfect for October 15 events, infant loss gift, birthdays, angelversaries, Father's Day, Mother's Day, Christmas, Valentine's Day, Anniversaries, holidays, remembrance functions, fundraising, or any heartfelt gesture.